3 yr old, Heterotaxy, s/p Fontan procedure. s/p Permanent pacemaker for sick sinus syndrome. Develops sepsis, returns from percutaneous drainage of pyonephrosis. Dexmedetomidine and ketamine were used for this short interventional radiology procedure. After return to ICU, the child has the following trace on the monitor. Interpret. 1) What is the underlying rhythm? 2) What is the pacemaker set at? Guess the mode and rate. 3) Is there native AV conduction? If yes, what is the native AV interval? 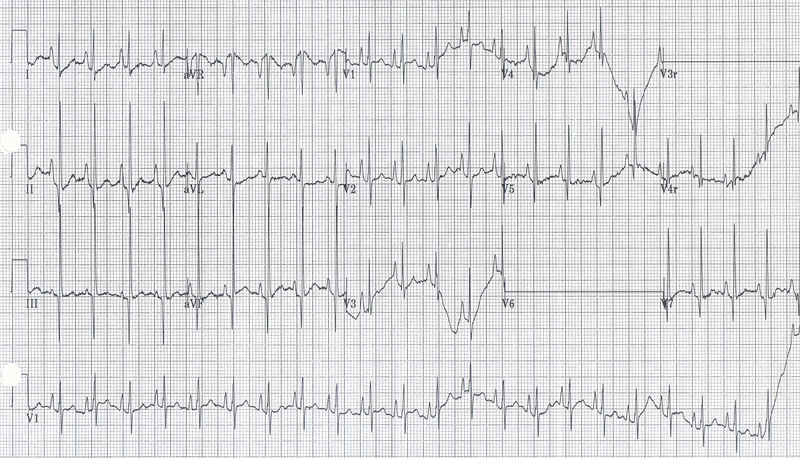 4) What is the AV interval for paced beats? 5) What is the pacemaker doing? What is the final assessment of this patient? 6) Why do the pacing spikes appear irregular? 7) How would you manage this patient? (Further studies tests and evaluations are necessary to make an assessment and management). 6 yr old boy, s/p Resection of subaortic membrane. Stable hemodynamics. ST segment elevation was noted on the monitor about 12 hrs after surgery. 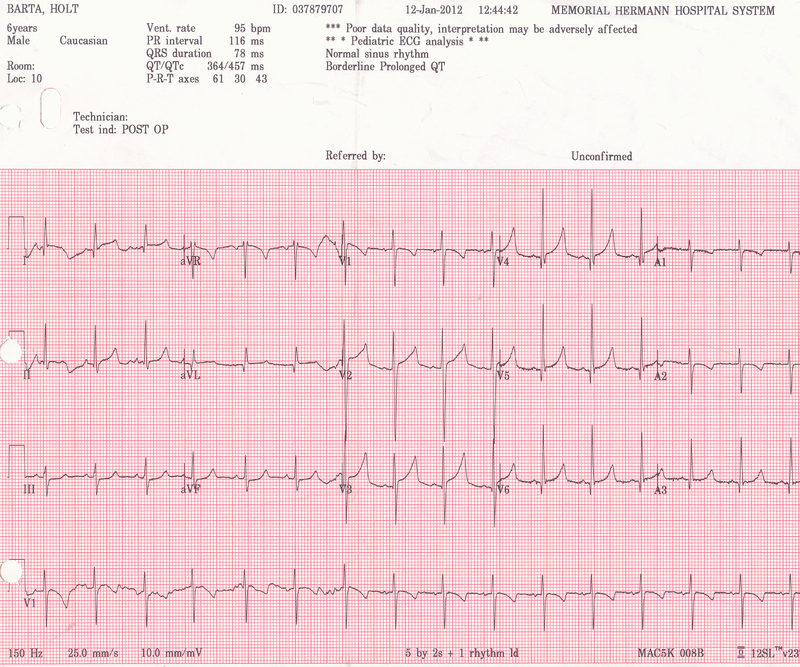 Therefore, the EKG in the upper panel was recorded. 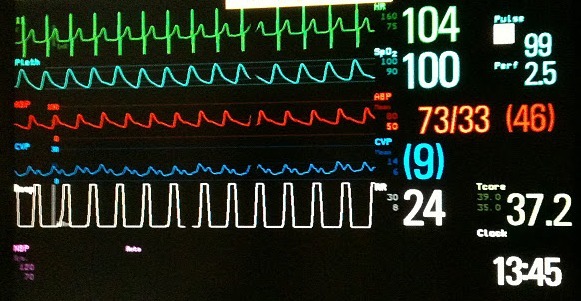 (Lower panel has the EKG recorded immediately upon arrival to ICU from the operating room ~10 hrs earlier). 3-month old, PA-IVS, s/p BT shunt only as newborn. Now, admitted for treatment of pneumonia. 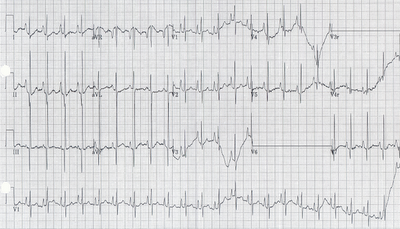 1) Name the prominent wave in CVP trace: Is it "tall" 'a' wave or "tall" 'v' wave? 2) What does it signify if the "tall" wave is 'a' wave? This is an EKG from the same patient. Pardon the artifacts.